Webkon Apps lets you choose from a list of top-in-line, professional photographers. From landscapes to portraits, from lifestyle to weddings, from events to fashion, find a photographer for any type of shoot with the least amount of effort. With a huge list of professional photographers to select from, you will be spoilt for choices. From portraits to wedding, from landscapes to leisure, from lifestyle to events, Webkon offers an array of photography services. Photographers can roll ot instant updates on an event that they are attending or a new service that they intend to offer and more for improved customer engagement. Photographers get to publish their bestselling photographs for acquiring more customers. Use Facebook, Twitter, and other social networking sites to upload the URL of your app and run campaigns for improved online presence. Re-engage your clients with the help of push notifications. Social networking platforms are the best ways to promote business these days. Now if you are wondering how can you share an app to your users. Well you can share the URL of the Webkon app through social networking sites like LinkedIn, Facebook, and Twitter. People have been using social networking sites more than ever these days. You will surely find most of your potential buyers through networking. Photographers know what offers and discounts mean to their customers. They give away offers and deals to capture the attention of the customers. Also, they roll out new packages every now and then. They need to keep their users updated about any change that they introduce in their business model. 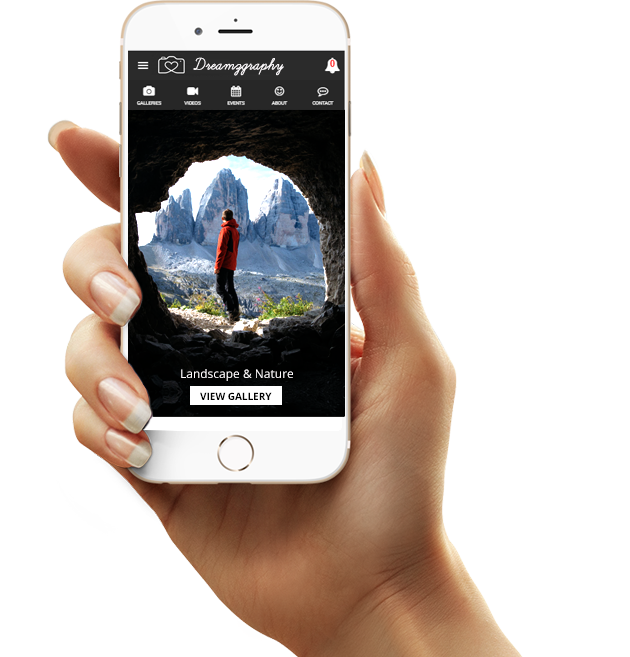 With Webkon apps, photographers get the freedom of sending notifications in real-time. The user gets the notification even in offline mode. Photographers can upload images of their past work to attract new customers. Photographs speak more than a thousand words. With so many people out there waiting to a hire a good photographer, a catalogue of photographs to prove your skills can never go wrong. Webkon apps allow photographers to upload photographs in a proper, attractive, and organized manner for the customers to view, review and make their decision of hiring you. With Webkon apps, photographers can improve sales and revenue. With the help of Advanced Data Analytics, you can capture, observe, and analyse data that can help your business improve such as bestselling type of photography, bestselling package, most popular wedding photographer, bestselling campaigns, most popular event photographer, and more. Based on the reports you can customize your services to ensure a growth in business. Webkon apps are progressive web apps and therefore are light and easy to use.The best part is that it ensure high performance and fast speed. A person with little or no technical background can easily use Webkon apps for photography. The apps offer native look and feel and thus can be easily used by even a beginner. Display as much content as you want. Webkon apps allow photography professionals to showcase as much information as they want.From images of an event to videos of a ceremony, from brief introduction of camera equipment used to in-depth descriptions of services offered, everything can be added without worrying about the app becoming heavy. Progressive web apps do not take away the memory space in the mobile devices of the users. Schedule appointments or book a photographer with the help of the app from the comfort of your home. The photographers can talk to the client in real-time and book a meeting or directly come to the venue where the shooting is scheduled. You can also talk to a photographer with the help of emails, instant messages and more. The user can share his query to which the photographers can promptly reply. You can stay connected with the photographer while the work is in progress for updates on your project.